Loudonville, NY. 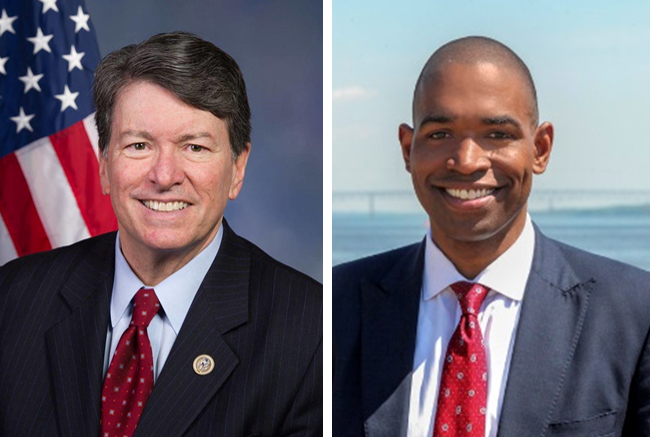 Freshman Republican Representative John Faso and his Democratic opponent Antonio Delgado are separated by a point. 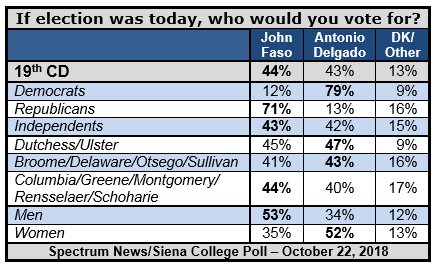 Forty-four percent of likely voters support Faso, 43 percent support Delgado, six percent are with a third-party candidate, and seven percent are undecided, according to a new Spectrum News/Siena College poll of likely 19th C.D. voters released today. Faso has a negative 40-46 percent favorability rating, compared to a 42-41 percent favorability rating for Delgado. 70 percent support from his own party and independents are separated by a point. “Men side with Faso by 19 points, while women side with Delgado by 17 points. Voters with at least a bachelor’s degree support Delgado by 20 points, while those with less than a bachelor’s degree support Faso by 19 points,” Greenberg said. “Voters under 55 are separated by a point, as are voters 55 and older. While the race could not possibly get closer over the final two weeks, it certainly figures to get even rougher and nastier. “Both candidates have become well known to the voters, with Democrats overwhelmingly viewing Delgado favorably and Faso unfavorably, and Republicans overwhelmingly viewing Faso favorably and Delgado unfavorably. Independents are closely divided but view each candidate slightly unfavorably,” Greenberg said. “By a narrow three-point margin, 48-45 percent, voters would prefer to see the House controlled by Republicans next year. Not surprisingly, more than 80 percent of Democrats and Republicans want their party to control the House, with independents nearly evenly divided,” Greenberg said. “Also by a narrow three-point margin, voters disapprove of the job Donald Trump is doing as President. Democrats overwhelmingly disapprove, while Republicans overwhelmingly approve. Independents are virtually evenly divided. This Spectrum News/Siena College 19th C.D. survey was conducted October 12-16, 2018 by telephone calls in English to 500 likely 19th C.D. voters. This poll has a margin of error of +/- 4.6 percentage points. Calls were made to a stratified weighted sample of voters from the L-2 Voter list via both land and cell phones. A likely-to-vote probability was computed for each respondent based on their stated likelihood to vote as well as by virtue of the imputation of a turnout probability score based on past voting behavior. This combined probability to vote score was applied as a weight along with a weight that considered party registration, age, region, and gender. The Siena College Research Institute, directed by Donald Levy, Ph.D., conducts political, economic, social and cultural research primarily in NYS. SCRI, an independent, non-partisan research institute, subscribes to the American Association of Public Opinion Research Code of Professional Ethics and Practices. For more information, please call Steven Greenberg at 518-469-9858. Survey cross-tabulations and frequencies can be found at: www.Siena.edu/SCRI/SNY.